Click on the image below to open and enlarge, after opening click again to 2 x enlarge and then scroll with your mouse’s thumb wheel while holding your “Ctrl” key in order to magnify the image larger or smaller, use your browser’s back arrow to return to this web-page. 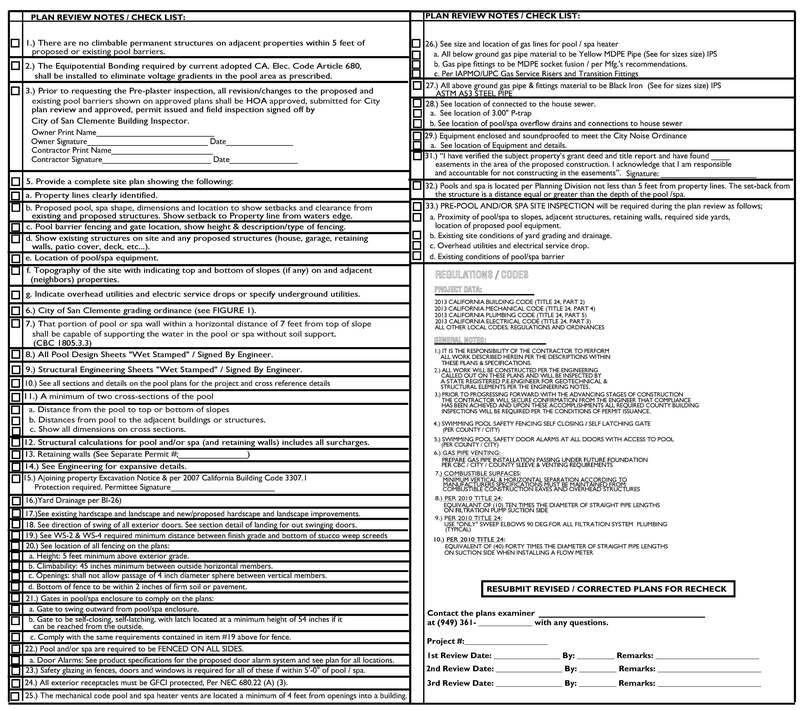 The plan listing sheet below exhibits the 1 thru 33 specifics that shall be required by the PLAN CHECKER’S review process. It is important to identify the delegates who shall be responsible for each item in making preparations for your submission. As you are aware the plans must exhibit ALL items listed for the PERMIT PROCESS. Our portion shall deal specifically with the MECHANICAL elements and the other considerations for what is deemed necessary will need to be bundled and collaborated with that information into a submittal package. The plan below is a REVISED Lower Basin Layout (need elevations) and will need to be corrected in order to accomadate the revised results for the latest structural engineering approach. Please see the Lower Basin’s layout and be sure that the revised engineering results provide for an adequate surface area 3:1 ratio (488-SF / 160-SF). Our portion of the design work scope shall deal specifically with the MECHANICAL elements. Components shall appear on plan as a diagrammatically represented numerically allocated symbolized exhibit. This requires your participation in order to become familiar and finalized with what is being called for and accepted as being true and accurate with your desires. Please review the symbolized 1 thru 45 outline listing below in order to become better acquainted with the considerations for what is deemed necessary and respond via the form below as being completed. Please review this information below on the webform and provide us with your input / comments on the form provided at the bottom of this web-page. Briefly describe any other features / component that you are entertaining for your project.